Christ University’s motto is excellence and service. The university provides for holistic development of its students with the values being faith, morality, love for fellowmen, social responsibility and pursuit of excellence. Christ University school of law is Bar Council of India approved. It offers two courses: BA.LLB and BBA.LLB. Both are ten-semester courses. The curriculum is designed in a way that the alumni stand at par with their global counterparts. The admission process involves a written law entrance exam, skill assessment test, micro presentation, personal Interview, and judgment on the basis of scores of the grade XII qualifying exam. The admission process for the CULEE exam started on December 8, 2017 and the exam is due on April 24, 2018 with the CULEE admit cards 2018 becoming available 5 days prior to the exam. The test center assigned to you, and its address. Take two print outs and keep them safe as there is no provision for duplicate admit cards. You cannot sit for the examination without an admit card and no communication in this regard will be entertained by the college authorities. You will also need a valid ID proof like the passport, driving license or the Aadhar card for appearing in the exam or else you will be barred. Along with the admit card and the ID proof you also have to carry with you two copies of your passport size photographs and two copies of stamp size photographs to the CULEE Exam center. The size should be 35mm*45mm. The background should be white. Your name and application number should be there at the back of the photo. 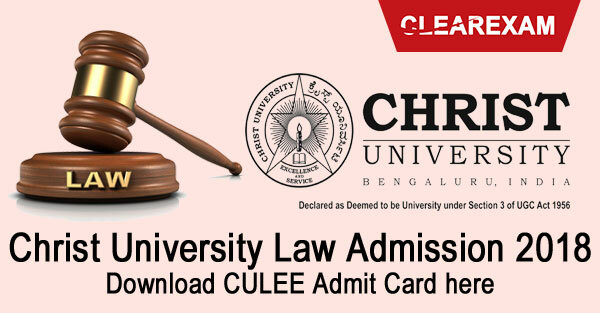 It is advised that you download the CULEE admit card as soon as it becomes available so that you do not panic at the last moment due to internet traffic congestion. Last of all, if you are sure that some information on your admit card is not correct then immediately contact the Christ University on this number 09243080800. The admit card should be preserved till the end of the entire law entrance exam admission process till seat allotment. Christ University will issue CULEE Admit Card 2018 from April 2018. CULEE Admit Card will be available in online mode only.